Change to the track day test times and price reduction. Please download the latest v3 of the supplementals. Due to a schedule conflict, the morning session of the open free test day on Friday will be canceled. You will have the track from 1pm until 5pm. No breaks. No other items change. Those that have been paid in full will receive a refund for $100. Paddock: Paddock spaces in front of garages are reserved for the team renting that garage. Pit Lane spaces will be assigned. Please contact mike.morrison@champcar.org for pit assignments. Concessions: Concessions will be open for Breakfast and Lunch on Friday – Sunday. The ChampCar discount expires February 1st, so if you need a room, give the hotel a call and book your room. This hotel is one of our favorites in the country! We're just a couple of days away from ChampCar's return to Sonoma Raceway. Below are your pit/garage assignments and final event info. Please read carefully! Supplemental Rules & Schedule - Please make sure you read the supplemental rules and event schedule found here. Gates - Gates will open for trailer drop from 6PM - 10PM Thursday evening then will reopen at 6AM Friday morning and stay open until 7PM Sunday. Everyone must sign the waiver at the gate. Paddock - Sonoma Raceway will have a practice Friday morning before our practice. Please be courteous of those you are sharing the paddock with. You may not be able to park outside of your garage until after 1PM. Paddock spaces in front of the garages are reserved for those teams renting a garage after 1PM. Tech - All cars will need to be tech'd for 2019. Bring all your paperwork filled out and make sure you have read the rules. Swap cars with no paperwork will likely be put in EC. Tech opens at 9AM on Friday. Decals will be handed out at Tech and will be required to pass tech. Decal locations are shown in the BCCR appendix. Please download and READ the 2019 BCCR here as we have had some rule changes. Also make sure you look up your VPI here before you arrive at tech so there are no surprises. Any tech questions please email Jay Mauney here. Registration - Make sure you tech first, then bring your yellow logbook and tech sheet signed by us directly to registration. Before you arrive, log in and check your driver roster for accuracy. Make any corrections ahead of time. If you are fully paid with the correct drivers, check-in is a 3 minute process. If you are not coming (work issue, car issue, etc), email me to let me know you will not be there. Novice & New to ChampCar School - 5PM Friday at the Media Center. See map in supps. Garage & Pit Assignments - Pit and garage assignments are found here. If you have any questions about registration, please contact Laura O'Rourke here. Any other questions you can contact me here. We're looking forward to seeing you all at Sonoma Raceway! Come to Iowa and I will loan you our car. It would only be 72 hours to come and return. Then another 36 to go home. I towed from Virginia. It's only a hop and a skip from Iowa. Your funny, Virginia is an easy tow. To Iowa that is. We plan to go west in 2020 to Sonoma. Does the miata have a plate?!?!?!!??! there are a few ecotec miatas here and we have all the rest of the spares. Would be a MUCH faster run not pulling a trailer... LOL! Plates are over rated, live life and take the risk. 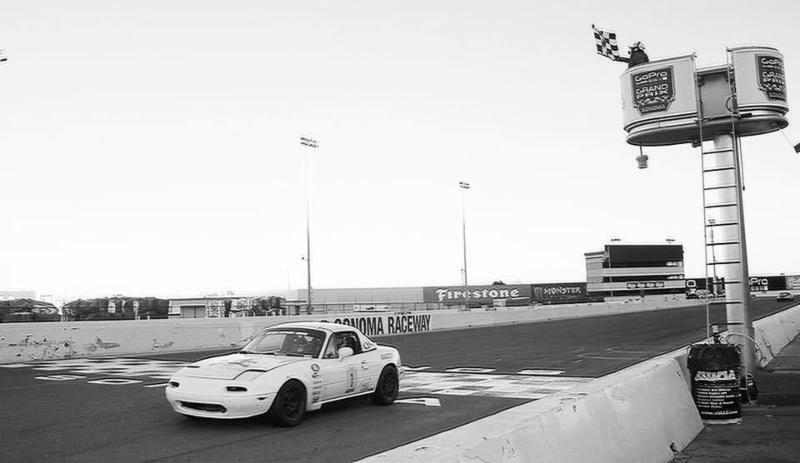 The Mielan miata should be able to outrun the police anyway! Hey I can put on a nice Lotus Elan plate for you since thats half our team name! Was just looking at the sups and it says they're seven hours in the header but in the info in the schedule shows us racing from 8am to 12pm and 1pm to 5pm (8 hours). So are they going to take the hour from the start of the race or from the end? I need to know for my master plan race strategy. send me an email to media@champcar.org with Sonoma Media in the subject line. last year there was fuel (lots of different types all the way to 112 I think), and the sups say "no fuel". Hopefully there is fuel there???? also - garages -- nothing in the sups about garages. For questions like these, it's best to contact the event director, Mike Morrison, mike.morrison@champcar.org. Then we can get the supps updated. I need to update the supps, but its on hold for a day or two. I'll get that info as Mike M has already got it to me. We have 85 cars for Road Atlanta. 22 for the tiny VIR south track. 20 for Sonoma. We are doing this race no matter how many show. I purchased my plane ticket and rental car. I am coming to this race. I am visiting my family in Vallejo. How can we increase the numbers here? I know there are arrive and drive teams that would love to come out and race if they had people asking. i know there are a lot of guys that would love to race, but just don't have the cars. Get your team ready for an exciting time at Sonoma Raceway! We're looking forward to getting our 2019 West coast schedule kicked off once again at Sonoma Raceway. Below is the important event info you need to read to make your weekend a little easier. Please read carefully! Tech - All cars will need to be tech'd for 2019. Bring all your paperwork filled out and make sure you have read the rules. Swap cars with no paperwork will likely be put in EC. Tech opens at 9AM on Friday. Decals will be handed out at Tech and will be required to pass tech. Decal locations are shown in the BCCR appendix. Please download and READ the 2019 BCCR here as we have had some rule changes. Also make sure you look up your VPI here before you arrive at tech so there are no surprises. Garage & Pit Assignments - Please email me if you would like to be next to a certain team. Garages are still available, please log into your ChampCar account and edit your race entry to reserve one. You will not be able to move into your garage until 1PM on Friday due to others using them for Sonoma Raceway's morning practice. Assignments will be sent out next week.